New Sewing Tutorials and Instructional Videos! Sergers can definitely be a tad tricky, but the end result is well worth it. In this video, weâ€™ll show you how to create a rolled hem on medium and light weight fabric. Whether youâ€™re just starting or have been serging for years, youâ€™re sure to learn something new. We know Sergers are notoriously difficult to thread, so weâ€™ve created a detailed, in depth tutorial to help you master an overlock machine. Follow along as we demonstrate step-by-step instructions from inserting the needle to navigating that tricky lower looper. Having durable, quality thread is key to successful serging. Maxilock is known for top-notch thread and at an affordable price. In this video, we talk about the threads Maxilock offers: 100% Polyester, Variegated, and Nylon. Using Maxilock means you have one less thing to think about while serging. If you want high quality and affordability, you've found the Serger / Overlock machine you've been dreaming about. As a Janome product, you know you're getting the best of the best and a machine that will last for generations. The 8002D Serger is great for beginners or sew-ers upgrading from an older version. This may seem like a basic serger, but you'll sew beautiful 4 Thread Overlock stitches and 3 Thread Rolled Hems with confidence and precision. You can tackle any sewing, from the sheerest chiffon to the thickest wool. And sewing knits has never been easier or more secure than with a serger. 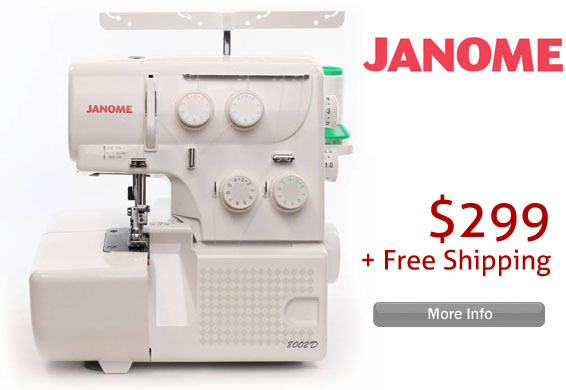 We know you'll love everything about the Janome 8002D Serger. Copyright © 2013 Sewing Parts Online, All rights reserved.